I believe that these vessels are canon and should be present in our arsenal. This Fighter is used by Starfleet only and is a standard, larger version of later interceptors developed by Starfleet. Large numbers of these ships were used by Starfleet in the Dominion War. 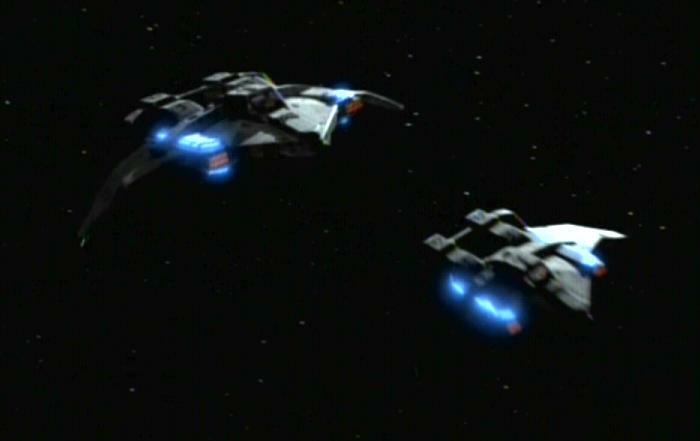 During Operation Return, eight successive waves of fighters were sent to attack the Cardassian ships of a Dominion fleet, hoping to provoke them into breaking formation and creating an opening for the Federation fleet. The attack fighter was capable of carrying an impressive arsenal. When used by Starfleet in 2374, the ships had several forward torpedo launchers and at least one phaser bank with two forward emitters. I would agree. They are present during our dear Sacrifice of Angels battle and seen on screen. Stats look good apart from the torpedo quantity. A few to many I think. to many torpedo launchers and too many phasers. I would think two forward launchers and 3 phaser banks. Also the length looks a bit too big, the average fighter is at max 15/16 meters (49-50ft) this thing is about 21mtrs (60-65ft). ex-USS Buchanan (DDG-14), a 4,526 ton (fl) guided missile destroyer commissioned in 1962. Three Hellfire hits, three harpoon hits and a 2,400 pound laser-guided bomb hit were not enough to sink the ship, which required an additional 200 pounds of scuttling charges before sinking. In my opinion we need to look at the danube class and all the fighters armament wise. Peregrines are bigger than most other fighters though from my understanding as they have sleeping room for two in them as well as some other room back there. Well, that's because they used the same kind of model as maquis vessels in DS9. two different types of ships. I can concede that looking at it, the thing is at least as wide as it is long so I've revised those. As for the phasers and torpedo turrets, that was me working with the information provided on Memory Alpha.